My patient aksed me the other day, "Can you help Peyton Manning?" The QB of the Denver Broncos NFL team, it turns out, was out due to a torn plantar fascia in the left foot. The plantar fascia is a band of tissue that runs from the heel bone on the bottom of the foot, across the arch, and inserts into the ball of the foot. 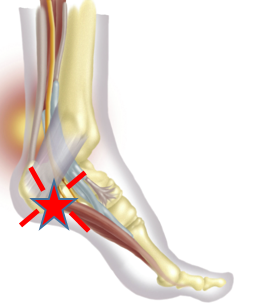 Inflammation of this band of tissue is one of the main causes of heel pain, or plantar fasciitis. With long standing inflammation of this band of tissue, it can cause micro trauma causing tears in the plantar fascia. A tear in the plantar fascia may be detected with ultrasound or an MRI, and at that time, immobilization in a walking boot or more less common in a below knee fiberglass cast will allow the tissue to heal. However, if the area is not treated, it may progress into a full rupture, where the tissue is torn. This is very painful, and is also treated with immobilization. Sometimes, there are materials that can be injected into the tissue to promote healing at the same time it is immobilized. So yes, if Peyton Manning needed my help, I could certainly oblige. To find out more about his foot, click here. However if you are having heel pain, do not delay! See one of our doctors and receive a proper diagnosis and early treatment, to prevent a tear, treat plantar fasciitis right away.